In case you had any doubts about what processor Samsung's upcoming Galaxy Note 9 smartphone would use, a fresh benchmark test is now available to cast them aside. Performed today, March 28, on Geekbench, the test shows that the Samsung Galaxy Note 9 (model number SM-N960U) is powered by Qualcomm's octa-core Snapdragon 845 chipset, aided by 6 GB of RAM - just like the recently released Galaxy S9+. Of course, this must be the North American version of the handset, as other markets will probably get an Exynos 9810-powered Note 9. According to the new benchmark test, the Galaxy Note 9 currently runs Android 8.1 Oreo. 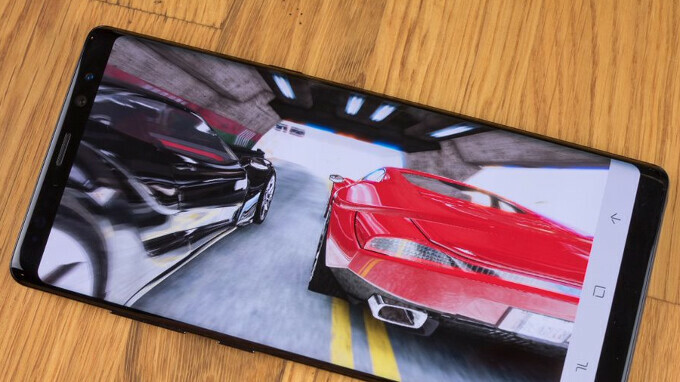 The phone's processor performance doesn't seem to be overly impressive, at least not for a device that'll be released in the second half of the year. 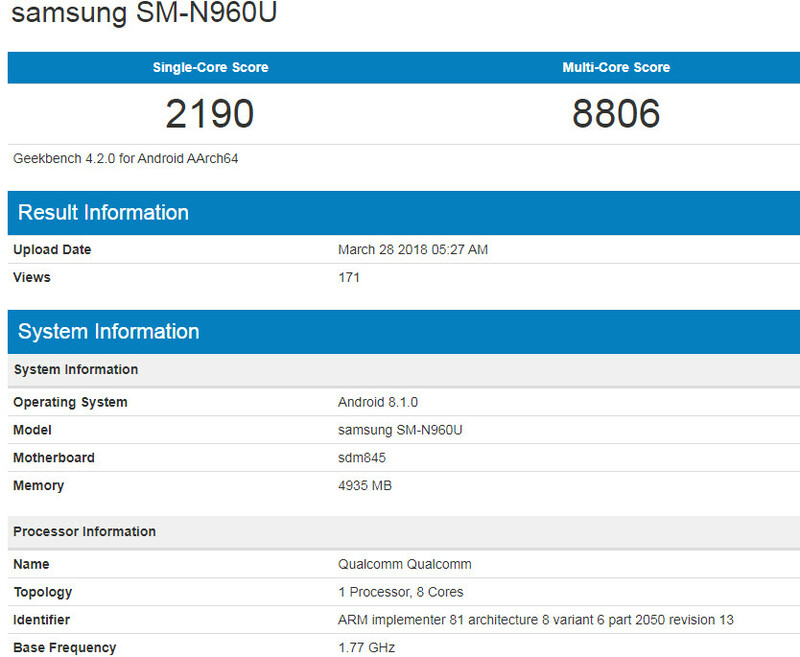 We're seeing a multi-core benchmark score of 8806, and a single-core score of 2190 - these numbers are comparable to those of the Snapdragon 845-based Galaxy S9+ (8420 in multi-core tests, and 2390 in single-core), and lower than those of the Exynos 9810-based Galaxy S9: 8894 in multi-core, and 3648 in single-core). Sure enough, things could get better for the Note 9 when the device actually hits the market. We're pretty sure that Samsung still has a lot of software optimization to do, and this might improve the phone's benchmark scores, although probably not by much. Samsung will likely announce the Galaxy Note 9 in August. The new Note could become the company's first smartphone to feature an in-display fingerprint scanner, while also packing a larger battery compared to the Note 8 (pictured above). We're also expecting camera enhancements, plus improvements related to the iconic S Pen stylus. This phone will be the hotness. Probably won't be a big hit due to the high price. Bleh... very predictable specs. Still was hoping for a return to the glory days when the Note was a beacon of the most obscene specs and such. It appears that the Note line has become something different. I know it probably isn't going to happen, but I would love to see a screen size increase to 6.4 inches. All the modern phones are so narrow, making the video area smaller than even the 5.7 inchers of yesteryear. They could easily make the screen a hair bigger and trim the top and bottom bezels to make the footprint roughly the same. Probably not gonna happen, but hey - a man can dream can't he? That is true, and there are many benefits to having a tall screen over a "regular" 16:9 ratio. The fact that I've never owned a 18:9 or taller phone kind of condemns my opinion too. I own a 16:9 5.7" Galaxy A8 and would rather not get a narrower screen if I don't have to. unfortunately such video is few and far between, when the actual released-for-public video comes with standard 16:9, but blackboxed. I want to see images better than the P20 pro, and in screen FP sensor. Samsung should add more 2 gig of ram since Note 9 going to pack with Spen software and aramoji. Samsung knows that the S9 are selling below expectations. Thus to create more excitement why not bring out more info the Note 9. 2018 S9 sales = less than 60-70 million through the year 2018 Note 9 sales = less than 15-20 million through the year Where in the world does Samsung make up the other 200 million phones to achieve 300 million sold in 2018? Apple sells these numbers in one quarter while it takes Samsung a full year to accomplish these numbers. Compete with Chinese OEM’s aren’t easy there midrange phones comes with 6 gig of ram. RAM is only one aspect of creating better performance. However, people care most about user experience. Hay brainiac, Samsung has more then 3 models. You isheep make me laugh. No one knows what they will sale in 2018 since we are only 3 months into the year. Don't get your hopes up, Timmy boy isn't going to send you a check. You still don't get it, Samsung has to compete with 100s of Android manufacturer whereas no one is selling iOS devices except Apple. If a customer want a Android devices he/she have 100s of choices & if he/she want's to purchase an iOS device than they only have one choice i.e. Apple. There is the 2017 and 2016 lineups, which are still selling pretty okay, given the amazing sales on them. Samsung also sells a lot of low-end phones in developing markets, since these $1000 phones are equivalent to half-year's wage out there. I'm actually quite surprised they sell so little. Unfortunately the price of S9 and S9 plus drops so fast S9 plus 755$ now and S9 650$. As everybody is copying each other why no other maker is making a phone with pen for less price, sure it would caught a lion share of the sales? Just put a huge battery in this year. If Huawei can out a 4000mAh battery in a 7.8mm phone Samsung has no excuse. Figure it out. nothing wrong with battery life? Even it's outperformed by the competitors and most users are happy to have longer battery life? for god sake, make 128 gb as the base storage now !! Meh.... The S9 isn't selling well either.